In the pharmaceutical space, for example, it’s imperative to know as soon as a competitor’s drug is approved in order to manage company strategy accordingly. Information about approvals, warnings, and other insights are readily available through regulatory websites that govern the pharmaceutical and medical device industries. Changes in status of a drug or device are typically reflected on the regulator’s site. Unfortunately, regulatory sites are notoriously difficult to navigate. Teams are often left combing through pages and pages of data in search for the information they need. This can make finding something extremely difficult, and time consuming. It’s a lot of CTRL+F, and it’s often not as fruitful as it needs to be. With Smart Search technology, it’s easy to find key information buried within documentation provided by major global health regulators. 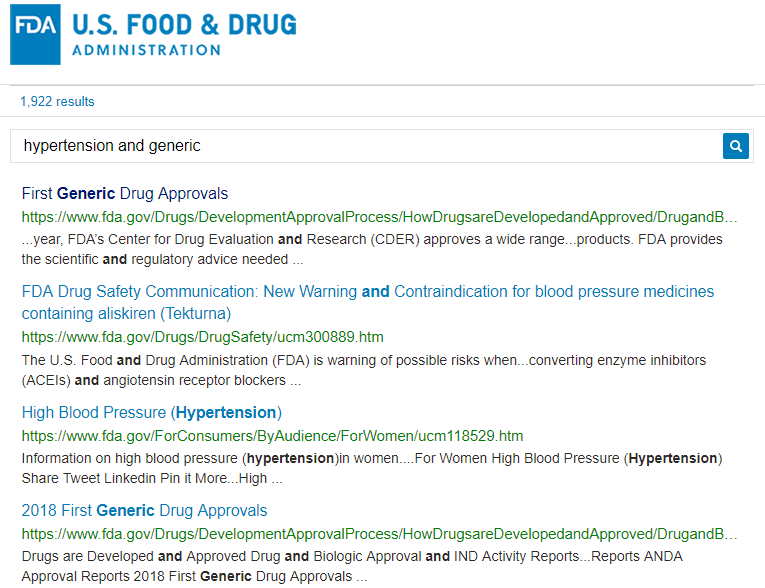 With technology powered by AI and natural language processing (NLP) key information from these agencies, including drug approvals and warnings, are captured and easily searchable. Say you’re involved with establishing a drug coverage policy for a health insurer. You would want to know which generics may be coming out for various pharmaceuticals, so you could prepare accordingly. For this example, let’s look at new generics approved in the U.S. for treating hypertension. To start, you could run a search in AlphaSense for hypertension and generic, and limit the source to surface insights from Health Care Regulators only. To focus on the U.S., you could filter down further to only to show information from the Federal Drug Administration (FDA). You’ll find that in May 2017, the FDA approved a generic drug called Nebivolol Hydrochloride for Glenmark Pharmaceuticals ($GLENMARK). But what if you’ve never heard of that drug before? In that case, search for mentions of the drug across all documents to surface the historical background information you need to add context. (Log in to view search here). Here, you’ll see the compound Nebivolol Hydrochloride was approved by the FDA for Watson Laboratories ($TEVA) in November 2015. 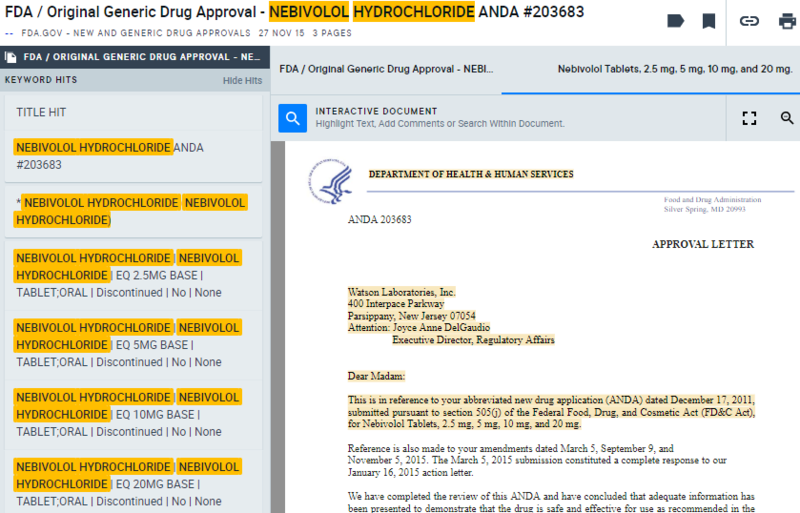 The corresponding approval letter (AlphaSense users can log in to view) for the Abbreviated New Drug Application (ANDA) mentioned that Watson’s drug was based on Forest Laboratories’ ($AGN) Bystolic, a hypertension drug currently on the market, and Watson’s version was “bioequivalent and, therefore, therapeutically equivalent,” to Forest’s. The letter also mentions that Bystolic was protected under patent until 2021, meaning Watson would have to wait until then to sell their generic. In effect, you just found information on a new generic drugs, competitive generics, the original drug the generics were based on, and the patent expiration date of the original — in only a few minutes. Say you want to continue monitoring new mentions of hypertension and generics within FDA approvals. With AlphaSense, you can set up email alerts to be delivered right when you need them to. This way, you can get this information right in your inbox within seconds of it being published. The results are abundant (1,922 entries!) and not very helpful at first glance. The first result is a page with general information about high blood pressure. It and doesn’t mention “generic” at all. This makes the data less contextually relevant, since the keywords are not within close proximity to each other. To get to the same information found in minutes with AlphaSense, you would have to dig through the noise and run multiple searches to find the relevant data you needed in context. Instead of wasting time with irrelevant search results, AlphaSense allows users to focus their time on analysis and communication so that they can advance their firm’s success, and their own productivity, beyond what they’ve experienced before.